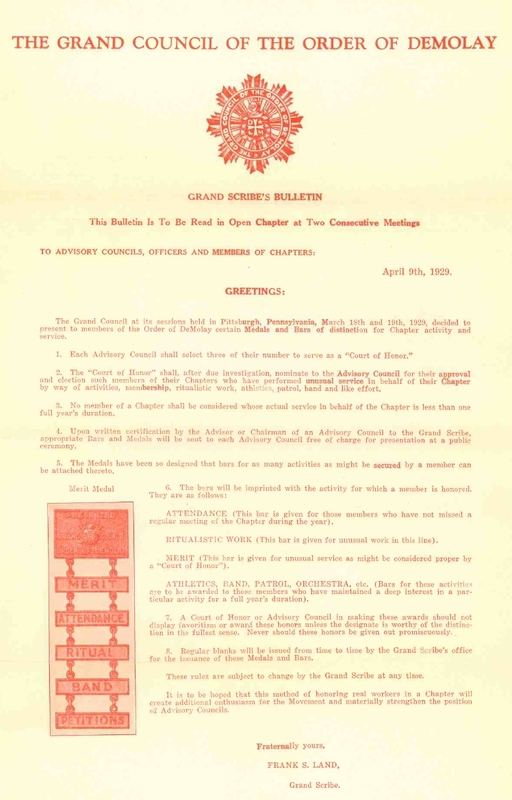 At “Dad” Land’s urging, the Grand Council created several awards for Chapter service in March of 1929, and he sent these letters, below, to outline an entirely new awards program for DeMolay members. The first, for a Meritorious Service Award, looks suspiciously like today’s PMC-MSA Award, and is likely its predecessor. 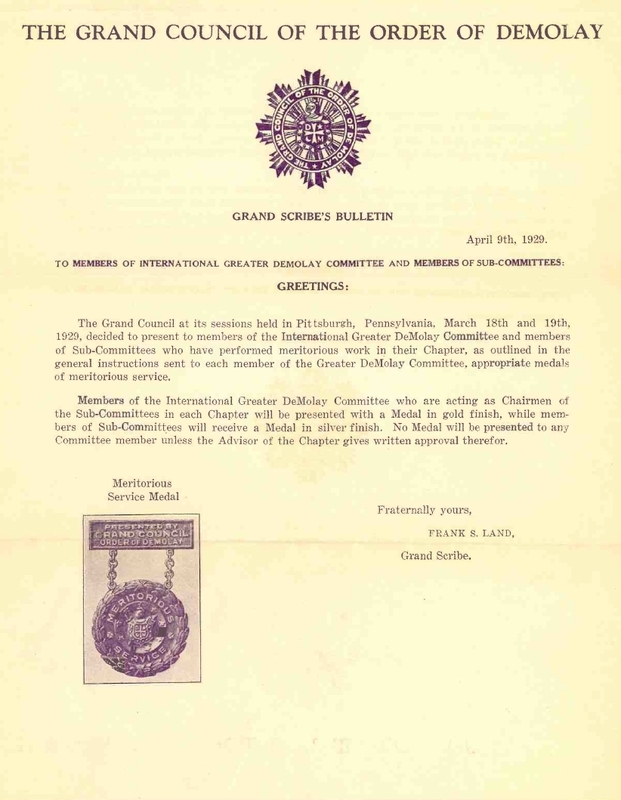 To get the Meritorious Service Award a member had to be appointed to The International Greater DeMolay Committee, or one of its sub-committees, by “Dad” Land, upon recommendation from the Advisory Council. It was awarded if the Chapter Advisor gave written approval for it to be awarded, and represented ANY kind of Meritorious Service—not just as a Master Councilor. 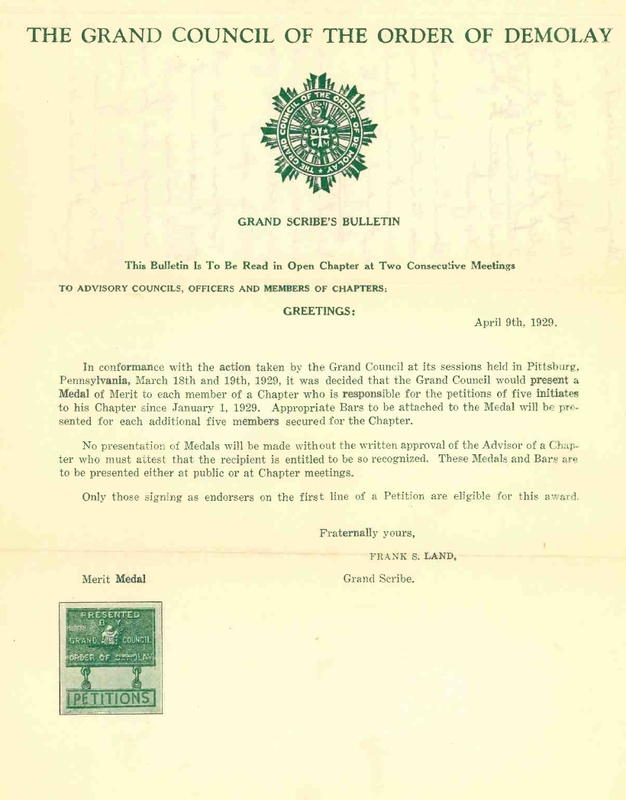 The second award was the MERIT AWARD, which we would think of as today’s Merit Bar header, and subsequent Petitions Merit Bars, because the only way to get it was to get 5 new members, and then a PETITIONS bar for every 5 petitions subsequently acquired. The third award is actually a series of merit bars for different areas of service such as BAND, PATROL, SERVICE, MERIT, RITUAL, ATTENDANCE, ATHLETICS, etc. The detailed requirements were not published, but a Court of Honor consisting of three Advisors would make selections based on what they felt the members had earned. It was subjective, rather than based on specific data. 1.) What do you think would be considered “Meritorious Service” today, in your Chapter, to justify awarding this to any of your members? Would your Advisors agree with your assessment? 2.) What is the current award that is closest to the MERIT AWARD? 3.) Why do you think we now have very specific requirements for each of the Merit Bars in our current awards program?